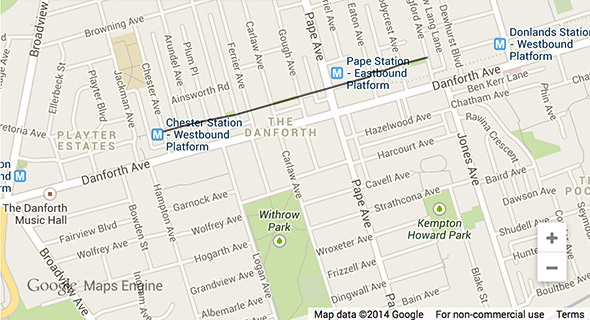 Is the Danforth ready for a linear park? Toronto has been seeking a linear park for some time now. The Belt Line Trail and the proposed Green Line along the midtown rail corridor notwithstanding, the goal of city park in the mould of New York's High Line hasn't been met. But that could be about to change, albeit in a small way, now that the city has agreed to study linking a series of east-end parkettes. The cluster of proximate but disconnected green spaces in question sit a few metres north of Danforth Ave., directly on top of the subway between Pape station and Langford Avenue. The Logan Avenue Parkette, which runs for three city blocks, and the slightly smaller Carlaw Avenue Parkette are both surrounded by unwelcoming surface parking. Advocates of the project say reconfiguring--and later possibly eliminating--the lots to create a single green space, linking Chester station with Langford Parkette, roughly a kilometre to the east between Pape and Donlands stations, would be a boon for the neighbourhood. Local resident and University of Toronto teacher Dylan Clark led a Jane's Walk through the area in May, repeating a walk he organized in 2010. Clark thought stitching together the disparate public spaces would result in a safer route for the kids that walk between Jackman and Wilkinson public schools. "I did the Jane's Walk four years ago and, no offence to Councillor [Case] Ootes, but he was the councillor at the time, and several of the people on the walk said there is absolutely no chance he'll do anything--in fact, he would actively fight this sort of thing," he says. "I was like: 'OK, well, I'm just going to shelve it then, if that's how it's going to be.' And then all of a sudden Mary [Fragedakis] got elected, and it's just an absolutely different attitude entirely." The timing sounds right. Local councillor Mary Fragedakis says multiple projects involving the subway corridor are currently underway, including public art installations, TTC second exit discussions, and park improvements, so it makes sense to tie them together. "I thought [Clark's] idea was so cool," she says. "It got me to thinking there needs got to be a better link for all these separate projects that are happening. An that's one of the biggest complaints most people have about the city is that one department doesn't talk to the other department. This is an attempt to fix that." 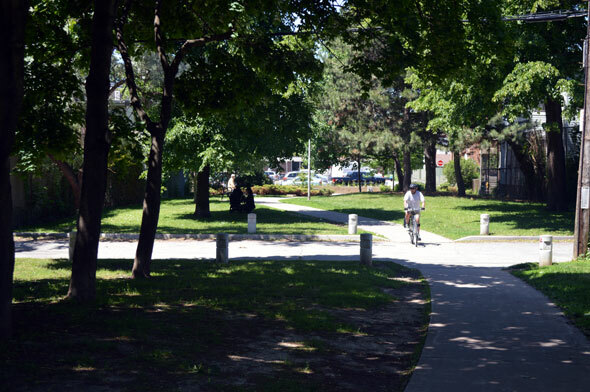 It would seem that a long park, configured for strolling, biking, and lingering, would be a good fit for the Danforth and its European-inspired atmosphere. In Spain, people gather on "Ramblas," linear public squares, in towns ranging in size from Barcelona to little Figueres near the French border. The challenge Toronto faces is to convince the notoriously auto-friendly city council to cede space to walkers. Even with approval, building the park won't be completely straight forward: creative solutions will be needed for the some thirteen road crossings that would fall within in the park and skeptical local business owners, concerned opening up a walking route away from Danforth storefronts will have a negative impact on trade, will need to be convinced the idea has merit. "So many of us ever since Jane Jacobs and beyond are looking at the city more and more in that way: slow people down, get pedestrian traffic, get cycling traffic," says Clark. "This is not antithetical to business, actually it's quite good for business." A motion to explore the possibility of a linear park, put forward by Cllr. Fragedakis, was adopted at this week's Toronto and East York Community Council meeting. City staff are due to report back later this year and work could begin next year.